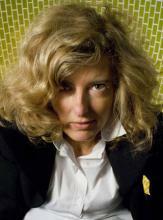 Teresa Sapey is an Italian architect and designer. She studied a degree in architecture at the Polytechnic University of Turin, where she graduated in 1985, and completed her academic training in Paris with another BFA degree at the Parson School of Design and a Master at La Villette. In 1990 she moved to Madrid, where she set up her own architecture studio. Actually, she is also a research professor at the University Camilo Jose Cela in Madrid and she has been visiting professor at several foreign universities (McGill Montreal University, Carleton Universtity of Ottawa, the University of Waterloo in Toronto, and the Domus Academy in Milan). Her work has been recognised with several prizes all over the world, such as Interior Architecture Prize of Madrid, 'Women Together' Prize granted by UN, 'Cavalliere della Repubblica Italiana' with Commendatore grade awarded by the Italian Government or the Anual Prize to the Interiorism Studio granted by Architectural Digest 8. She has done several projects, such as Hotel Puerta de América's parking or the one located in the central square of Vázquez de Mella in Madrid. In 2007 she won the competition for the reform of the Palacio de Deportes in Madrid, and, in 2012, Paris Photo and ARCO VIP Lounges were designed by her. 'My aim is to work with spaces in order to create all kind of emotions. It doesn't matter wether people like or dislike my work; it is all about creating emotions. From my point of view, architecture should be able to create different feelings so that it can be both, emotional and functional', Teresa Sapey.